Being the most beautiful beach city of Vietnam, Nha Trang is justly famous for shopping, sightseeing and ourdoor activities. 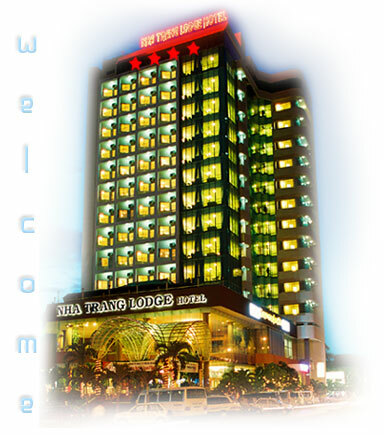 In the heart of this vibrant, beautiful and charming city is Nha Trang Lodge Hotel, an international four stars hotel which imposingly faces of the beautiful Nha Trang Bay, one of the Most Beautifull Bays of The World. The hotel offers 125 rooms that are fully carpeted and equiped with mini-bar and air-conditioner, attached bathroom with bathtub & shower and balcony with a view of the sea, IDD telephone and satellite television, modern elevator. Other facilities include lobby bar, 24 hour room service, restaurant, tour desk, business centre, conference room, laundry service, airport transfer, beauty saloon, discotheque, Jackpot, massage, sauna, steambath, jacuzzi, foreign exchange, souvenir Shop and swimming pool. 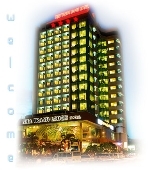 Guest staying in Nha Trang Lodge Hotel will be pleasant by the well skilled & professional staffs.In fact , from its opening in July 1996, our hotel has been the center of important events in the city. Through the years , the Hotel has ever attracted a large number of tourists. 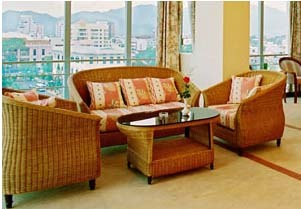 It is the ideal home away from home for leisure or business travellers. Whether your stay is for business or pleasure, you can be assured of the ultimate in both comfort and services. There is no better choice than the Nha Trang Lodge. There are 120 rooms available in this hotel. All rooms are well furnished, nicely decorated and equipped with the modern facilities to ensure all guests comfortable of stay. Room amenities included individually controlled air-conditioning, televisions with satellite programs and fully stocked minibar. Whether you are visiting for business or pleasure, the hotel sure you will find accommodations more than satisfying. 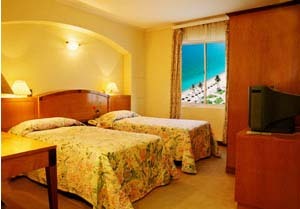 The hotel offers 67 Standard Low Floor Rooms are 26 sqm, located on the lower floors. All room equipped with all comforts to ensure you a relaxation and pleasant stay. The hotel offers 32 Standard Upper Floor Rooms are 26 sqm, located on the upper floors. 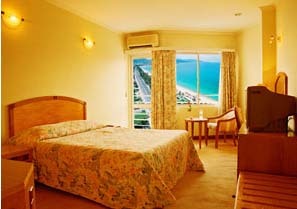 The rooms are large in size and well equipped with saintly fitting to ensure you a pleasant stay. The hotel offers 10 Superior Rooms are 30 sqm, and have corner balconies offering panoramic views of Nha Trang and the coast. 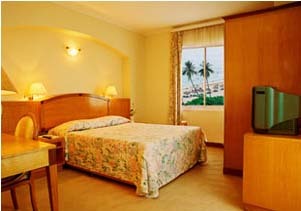 All rooms are large and equipped with all comforts to provide you with complete relaxation for your stay pleasure. Suite Rooms are a large 52 sqm and have 2 bathrooms. Suites are suitable for families as they can sleep 4 persons if 2 extra beds are added. Extra person charges may apply. 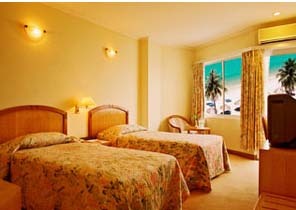 Each suite comprises one huge room with facilities for entertainment and business. A valet service is available for guests staying in one of 11 suites. The restaurant – bar offers international and traditional food. Guests staying in Nha Trang Lodge Hotel will have opportunity to savor the best of European, Asian, seafood specialties as well as Vietnamese cuisine. PHO24 is uniquely designed to provide excellent Vietnamese Pho noodle with international quality standard. The most popular Vietnamese tradition dish is ever-upgraded to deliver not only the delicious food also the cleanliness, the cozy ambience and the customer satisfaction. Nha Trang, a tourist famous city lies on the Coast of the Eastsea. Located in the Southerm Part of Center Vietnam.In which, Nha Trang Lodge Hotel is right on the beachside and 35km from Cam Ranh Airport where there are daily flights from major cities such as Ho Chi Minh city, Hanoi and Da Nang. Besides, The Hotel takes only 5 muinutes drive way to Railway Station and walking distance to most major tourist attractions, shopping and entertainment sites.